Come and visit us and experience the beauty and intelligence of our elephants in a close-up interaction. Please note that since this is an educational and research facility, every booking includes a hands-on interaction. Advanced booking is recommended as the elephants might be feeding on another farm or involved in research. For more information and bookings please contact us here. A close, personal and safe encounter with our 7 gentle giants in the hands of our knowledgeable handlers. Elephants can carry 25% of their body weight comfortably. 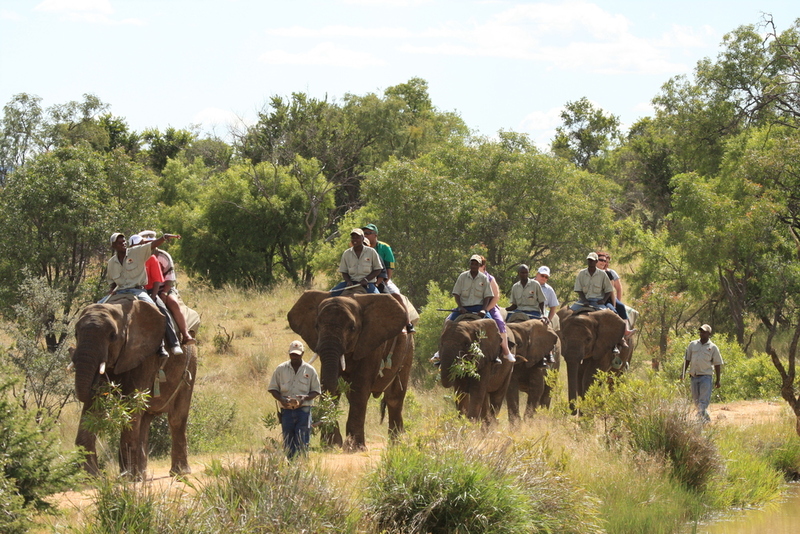 Our rides are a maximum of 30 minutes through the bush on ergonomic, soft saddles for the elephants' comfort. You will have the opportunity to spend some intimate time with some of these majestic elephants in the water, while brushing & bathing them (with a bit of splashing thrown in). There are also great photo opportunities where you can pose with the elephants mud bathing and swimming in the background. · This is an add-on activity to our standard educational Interaction or Safari. · Limited to a maximum of 10 people. · Participants must be 12 years of age or older as well as be physically fit. · Children under the age of 18 must to be accompanied by an adult. · Cost: Additional R 660.00 per person (adults & children). · Duration: 12h00 - 14h30 (inclusive of the standard activities). · Times: Everyday at 12h00. AWE operates on a 'first pay = first serve’ basis and only once we have received your payment in full will we secure your booking. Should you make a 'provisional' or 'pay on arrival' booking through our bookings office you may lose out on your space as 'provisional' bookings will not be held until payment is received in full, and we will take paying customers over provisional customers as many prvisionally booked customers do not arrive. Walk-ins are accepted, however we cannot guarantee that they will be able to join in on an activity if it is already fully booked, or if the elephants are otherwise engaged. AWE reserves the right to terminate any elephant activity, at any stage, for any reason it deems neccessary for the safety or welfare of its elephants and clients. Safety procedures are explained in detail on arrival. Prices and activities subject to change without notice.